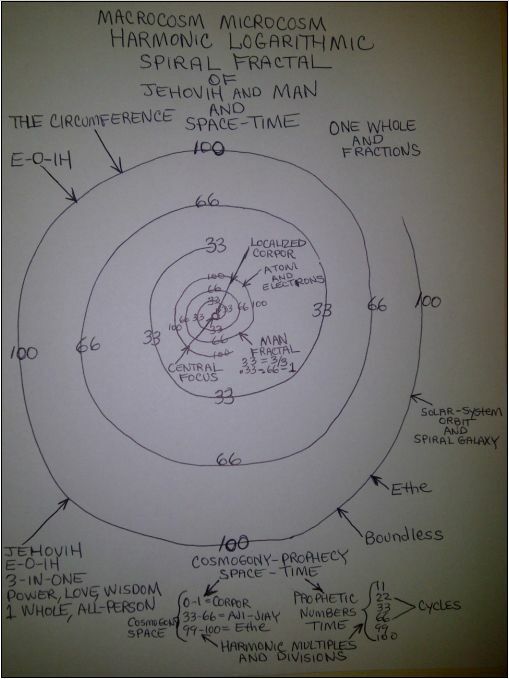 Above drawing shows man as the central focus and fractal of Jehovih the All-Person. Macrocosm and microcosm is an ancient Greek Neo-Platonic schema of seeing the same patterns reproduced in all levels of the cosmos, from the largest scale (macrocosm or universe-level) all the way down to the smallest scale (microcosm or sub-atomic or even metaphysical-level). In the system the midpoint is Man, who summarizes the cosmos. Man is the fractal (harmonic division) of the Father Jehovih. Man is the central localized focus or fractal of E-O-IH the Creator. Jehovih is the boundless whole, the circumference beyond space and time. Within the seed is all the atributes and characteristics of the parent. The seed, genetics, is the fractal of the whole, the clone. One of the defining properties of fractals is built in “self-similarity.” A figure is self similar when parts of it contain small replicas of the whole. Every part of a strictly self-similar structure contains an exact replica of the whole. Don't you believe that I am in the Father, and that the Father is in me? We are in the All-Person Jehovih and the All-Person Jehovih is in us. Cosmic fractals are fractions (numbers, mathematics) of a repeating pattern (repeating numbers) on a smaller scale. A'ji and Dan fractals = 1/9 = .111, 2/9 = .222, 3/9 = .333, 6/9 or 2/3 = .666, 8/9 = .888 = prophetic numbers, 11, 22, 33, 66, 88, etc..
.200, .400, .500, .600, .800, 1000, 3000, etc.. = 200, 400, 600, 800, 1000, and 3000 year cycles. 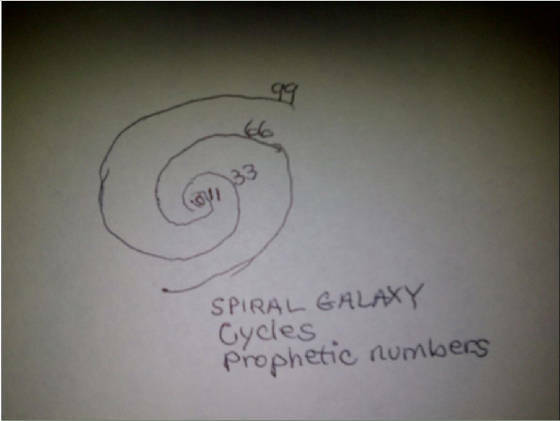 The numbers repeat, and the cycles repeat = frequency, fractal pattern. A single digit repeating sequences in their decimal expansions (.000…, .333…, .666…999). Google frac·tal: MATHEMATICS 1. a curve or geometric figure, each part of which has the same statistical character as the whole. Word Origin & History: fractal, 1975, from Fr., from L. fractus "broken," pp. of frangere "to break" (see fraction). Coined by Fr. mathematician Benoit Mandelbrot in "Les Objets Fractals." A fractal is a "chip off the old block"
"But man, like every other thought of God, was but a seed, a seed that held within itself the potencies of God, just as the seed of any plant of earth holds deep within itself the attributes of every part of that especial plant. "So spirit-man, as seed of God, held deep within himself the attributes of every part of God. - The Aquarian Gospel of Jesus The Christ, by Levi H. Dowling. <-----Fractal geometry, <------"The Ocean Lives Within The Drop"----"I am in the Father and the Father is in me" - ◄ John 14:11 ► of the Bible. each cell is a universe. DNA (containing the fractal double-helix spiral) is the seed or fractal of the species (the God - HU-man) species. The word "God" can be plausibly derived from the Sanskrit word "HU"...called HU, the spiritual world." Native American Jim Velasques said God (the Creator) is in all things, but he prefers (thinks) to dwell in man (mankind - angels). mankind = creative thought = thinks = Godlike (in the Image and sameness, fractal part of the ALL-Self). Mankind = Human form = has the most CREATIVE POTENTial so Jehovih God prefers to dwell in (operate through) that form (form follows function). Arthur Middleton Young (November 3, 1905 – May 30, 1995) was an American inventor, helicopter pioneer, cosmologist, philosopher, astrologer and author. Young was the designer of Bell Helicopter's first helicopter, the Model 30, and inventor of the stabilizer bar used on many of Bell's early helicopter designs. He founded the "Institute for the Study of Consciousness" in Berkeley in 1972. Young advocated a process theory, which is a form of integral theory. These theories attempt to integrate the realm of human thought and experience with the realm of science so that the concept of universe is not limited to that which can be physically measured. I am, and I move. My hand moves. Life in me makes my hand move. Therefore life is primus; motion comes afterward. Life in me causing motion shows that life moves all the universe. It is the I AM, self‑existent everywhere. I cannot exist separate from thinking, nor can my life move even my hand without thinking. Therefore thinking is before life itself. I could not think if I had not inherited it from the I AM. Therefore He is the Knowledge pervading all life and all corporeal things. This thinking is ka. Everything in all the universe is in motion, change, except for one thing which is still, the Creator. Be still and Know I AM. Stillness is the Creator of Motion, Space and Time. The Creator does not move, does not change and it is Everywhere. does not move or travel. The Creator is the UNMOVED MOVER. Space and Time is motion, involves 2 or more things, not ONE thing. The Creator is ONE thing, The Universal One. The Everpresent Ominpresent Universal One. The Great Spirit. 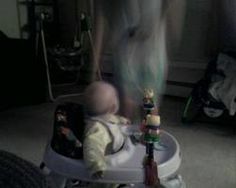 Motion, space and time requires 2 or more things. Because of the inverse square law of physics the Creator would have to be everywhere (omnipresent) to be all-powerful, because if the Creator would be located in just one local area it's light intensity (power) would decrease by the square of the distance from the source, if you double the distance the light intensity would be half. And if the Creator's light or intensity (power) does not decrease or fall of in any part of the infinite universe, then you would not be able to tell the difference of where the Creator is and what shape the Creator has, so this is why an all-powerful Creator would have to be everywhere (omnipresent), and would not change or decrease, and would not have a shape or form. But you, Daniel, keep this prophecy a secret; seal up the book until the time of the end, when many will rush here and there, and knowledge will increase." 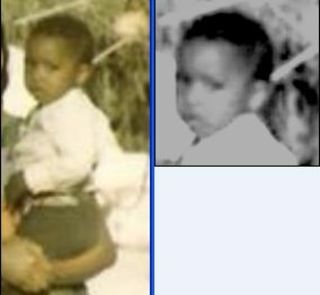 http://biblehub.com/daniel/12-4.htm the time of the end = end of the arc of Bon cycle or the Kosmon era (Aquarian Age). 3. According to the different structure of the living, so is My inspiration manifested by them. [form or structure follows function,man and animals have different forms and functions]. 1. Although all inspiration goeth from Me to all the living, directly, yet I also created man susceptible to indirect inspiration from all My creations. 2. Whatsoever receiveth from Me direct, is in harmony with Me. 3. The lily and the rose I created perfect in their order; the female bird I inspire to build her nest in season, perfect in her order. 4. Even so is it with all My created beings, save man. All the rest err not, in the order I made them; and they all fulfill the glory for which I made them. 5. But because I made man capacitated to receive inspiration from all things, he manifesteth both, evil and good; according to his birth and surroundings, so is man good or bad. 7. And I sent my angels to man, teaching him how to distinguish the difference in the inspirations upon him, that he might govern himself accordingly. 9. To love thy Creator above all else, and thy neighbor as thyself. 10. To give delights only, and not pain. 12. To do not violently against His creatures. 13. To be considerate of the liberty of all the living. 14. To interdict not the happiness and hope of others, only where thou canst return a transcendent glory and hope in place thereof. 15. For these are direct inspirations from thy Creator. 20. To destroy Jehovih's created beings. 21. To strive for thyself, above another. 22. To gratify thy flesh at the expense of purity or wisdom. 23. To be false to Jehovih. 24. To be false to thyself. 27. To cohabit in the gestative period. 28. To engage in strife, or to aid and abet conflicts, which are the fruit of carniverous food, transmitted in birth. 5. I am the All Highest! My service extendeth forever. I go not, but I am afar. I come not, and yet I am near. My voice is in all places. The light of the soul of man heareth Me. and nitrogen (darkness) to growth. 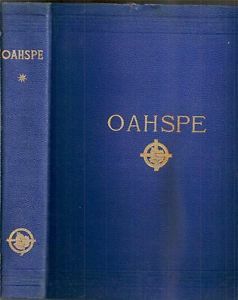 Oahspe states a'ji plays a role in hu-man tallness. Oahspe connects a'ji with giants. in persons between 7 feet and 9 feet in height. 7 feet and 9 feet in height (giants). quantity and is most frequently the limiting factor in crop productivity. A plant receiving sufficient nitrogen will typically exhibit vigorous plant growth. ...For which reason nitrogenous plants grow rapidly at night,..."
have been listed at 7 feet, 3 inches or taller [giants]. Only one is active as of 2013, Hasheem Thabeet of the Oklahoma City Thunder. The tallest to be inducted into the Basketball Hall of Fame is 7 feet, 4 inch Ralph Sampson. Gheorghe Mureșan, he is one of the tallest players in NBA history, along with Sudanese player Manute Bol, who was also 7 ft 7 in. Manute Bol, a Sudanese-born basketball player and political activist. At 7 ft 7 in (2.31 m) tall, he was one of the tallest men ever to play in the National Basketball Association, along with Gheorghe Mureşan. Yao Ming (born September 12, 1980), At the time of his final season, he was the tallest active player in the NBA, at 2.29 m (7 ft 6 in). Diet (protien, high nitrogen content,), vitamin D, genetics, hormones, and envirnment also play a role in height. 16...Mortals must have sufficient a'ji, that the race become not extinct; they must have a sufficient dan, that they become not as beasts. Cold a'ji Ice Age period 24,000 years ago (22,000) B.C. helped produce Giants on the Continent of Pan before it was submerged in the Pacific Ocean during the arc of Noe. 26,500 - 19,000–20,000 BP Last Glacial Maximum, what is often meant in popular usage by "Last Ice Age"
The Last Glacial Maximum (LGM) refers to a period in the Earth's climate history when ice sheets were at their maximum extension, between 26,500 and 19,000–20,000 years ago, marking the peak of the last glacial period. During this time, vast ice sheets covered much of North America, northern Europe and Asia. Just as Nitrogen (darkness, 66, 666) makes plants grow big, so does a'ji (darkness, 66, 666) make humans grow tall (giant). grade of six hundred  in the a'ji'an roads, twenty-four thousand years before kosmon. THE HISTORY OF THE FLOOD. 25. In four great divisions of the earth, in Vohu, in Jud, in Thouri and in Dis (see Sethantes, chapter II, v.28) they left not one alive of the I'hin race. In Whaga (Pan) had I a remnant; and they were scattered far and near, and in separate places hiding away from their evil pursuers. 4...the I'hins were small and slender, but the Druks were tall and stout. Cold a'ji Ice Age period 24,000 years ago (22,000) B.C. before Pan was submerged in the Pacific Ocean during the arc of Noe. The Ethereans (Gods and goddesses, Orions and Nirvanions) descended to earth for the sinking of Pan during a time of Dan (600 is a dan number/time) even in the midest of a cold a'ji period (Ice Age) just as the founding of The United States of America was during a warm (dan-light) period even during the cold period of "The little Ice Age". It is as if the cold nebulous cloud of a'ji was parted for a few years (1773-1776) to allow the light and inspiration of the high heavens to shine through (the same during the time of the sinking of Pan). 4. When His voice called the legions in high heaven, from every side, and below and above the earth, there moved myriads of shapely stars, which were ships of fire, coursing the firmament, whereon rode the Gods and Goddesses called by Jehovih to the labor of earth and hada. 5. Closing in on every side they came, and nearer and more compact, and brighter, with sparkling pillars of fire, and down-swaying curtains of light, till all the space around about the earth was hedged in with this army of Jehovih's etherean ships of fire. The Father Jehovih is Omnipresent and does not travel, does not move. 7. Show them My suns and stars in the firmament above; for they are My written words. My voice proceedeth in the space of heaven; the wise angels of My exalted places hear the sound going forth. Photosynthesis occurs at high rates when there is sufficient nitrogen = balance between light and darkness. 576 is almost at the perfect center of the green range of the color spectrum. No coincidence most plants are green in color = life, balance of light and darkness. Kosmon race = green, mature growth, balance between light and darkness, Ghan and Mongrel.